The San Diego Padres own the worst record in baseball and might be looking at a long rebuilding process, as the team tries to parlay its impressive farm system into future success. This doesn’t seem to bother Chase Headley one bit. The team’s starting third baseman and no. 3 hitter owns a diverse skill set: He’s a strong defender who draws walks, runs well, and drives balls into outfield gaps when his swing’s right. At 27 years old, Headley still feels he has a lot to learn, even as he holds the unlikely title of longest-tenured Padre. Wanted to start by asking you about your great start to the season. Did you make any adjustments this offseason, or is this just one of those things that happens to be happening at the start of the year? Yeah, I’ve been getting on base pretty well, having good at-bats. I think over the course of the year that will translate well to have a good season. Haven’t really changed a whole lot. In spring training I did work on a few things to hopefully get back to driving the ball like I did a few years ago. Other than that, same approach, same idea when I came to the plate. Right, last year was tough for you. You talked about approach, but really injuries kind of derailed your season a bit. How much did injuries hamper you, especially in the power department? I’m not a guy who’s going to hit a ton of home runs, but I should have hit more than I did [laughs). Right, missing six or seven weeks. Then when I came back it was late in September so I didn’t really get a rehab, I just kind of got thrown into there. That was a little part of it. But there were definitely some things mechanically that we wanted to take care of too. Did the hand injury linger at all into the offseason? Not really. It just needed a little time. For probably a month after the season was over I could still notice it. But after that it felt just like it normally does. When you say you looked at your mechanics, you’ve got things like the Bloomberg iPad app for players where you can look at video and various matchups. To what extent do you use that kind of technology, or really any kind of technology, to get better? Well we have, through our video department, a ton of resources. I don’t do a ton of stuff on my iPad. But we have everything you could possibly need in our video room. We’ll have Mike [Tompkins] send us video of our hits or anything that can help us. We definitely use it to analyze opposing pitchers, your swing, that type of thing. Is it always you requesting that information? Or will they ever come to you and say, “Hey, look at this”? No, it comes from you, or your hitting coach. Sometimes your hitting coach sees something, wants to point it out to you. It’s a lot easier to point it out on video and say, “Look, this is what I see,” rather than trying to explain it to you. I wouldn’t call it a crutch or anything. But it’s a nice resource to have. Tell me about hitting in Petco. This is an extreme pitcher’s park. And you’re a switch-hitter so it affects you in different ways. Left-handed it just eats up power, just destroys it. Right-handed it plays a little closer to neutral. But overall definitely a pitcher’s park. What if anything do you try to change? Do you try to become a doubles hitter? Do you try not to put the ball in the air as much as you normally would? You know, I did make an adjustment when I first came up. It doesn’t play to hit a ton of flyballs there. So I did try to flatten out the trajectory a bit. But as far as what I do now at home verses road, it’s the same thing. I don’t change anything. The splits are a little more drastic than I’d like. Some places you see the ball a little better. But overall, I don’t change anything. So mechanically you don’t change anything. But do you ever have a homestand where you go 1-for-22 with six flyballs to the warning track and you go, “Oh man, this is terrible”? You sure try not to. Because that’s when you get in trouble. We know as a club that the ballpark is what is. You can win games there, and that’s the most important thing. Whether you’re winning 10 to 8 or 2 to 1, it doesn’t really matter. We need to find a way to win. And if you get too caught up in your own individual numbers and what the park is doing to affect those, that negatively impacts the team. Obviously there are other elements of the game that you can focus on if you know you might not hit 20 home runs. Do you pay extra attention to your defense, base running, skills like those? Definitely. We know that the margin for error is smaller at Petco than it is at other places. An error or a base-running mistake, a walk, it can be the difference in the game, where somewhere else you might have a little more room to work with. So yeah, absolutely. Base running is something I a take a tremendous amount of pride in. I’m by no means that fast, but I do my homework, I study pitchers, I’m always looking for opportunities to take an extra base. As a club, when we do things like that well, it can win you 10, 15 games a year. Is that a point of emphasis in spring training, where coaches might say something like, “Hey, let’s take a sharper angle rounding second”? Definitely. Two or three years ago is when it took a noticeable change, a big emphasis. Really the first year we put that in place was 2010, when we won 90 games. Everybody was expecting to be awful, and we played really well. And I think that was a huge part of it. I think that’s something we’re always going to have to do, being in the market that we’re in, being in the ballpark that we’re in. We’re going to out and bring in Albert Pujols or some other big-name free agents who’ll hit a bunch of three-run homers and win games. It’s just not going to happen. So you have to focus on those little things. You have to run the bases well, you have to be good defensively, you have to keep the walks down for the opposing team, because those things really hurt you. You try to. You definitely take some things that he did. Going oppo a lot, things like that? Yeah, things like that. But it’s different with him because he could hit a flyball to left field and hit it five rows deep. Where if I get the same pitch, take the same swing and hit it the same, it’s caught on the warning track. As tremendous a player as he was, I think that Petco affects the not-superstar more than it affects the superstar. You can overcome a little bit of that when you have a tremendous amount of ability. Not that it didn’t affect him, because if you see what he’s doing now, in a different ballpark … so you see that. I would say while I did learn some things from him, in some cases you can’t, because there are times you look at what he does and just say, not everyone can do that. You were the young guy, but not really anymore. And you have some people now saying this is the best farm system in baseball. Some of these guys are starting to come up. Yonder Alonso is already on the roster. Has that changed your approach? Do you try to play more of a leadership role now? You definitely have to be a little bit of a leader. I think I’m the longest-tenured Padre, believe it or not. There’s a certain dynamic that comes with it. I’m not an extremely vocal leader. I try to do my leading by the way I play, the way I prepare myself. Hopefully that carries over well. 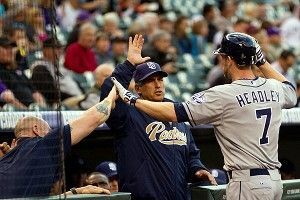 What kinds of expectations did Bud Black and the coaching staff set this season? Because this is a very young club, but 2010 is also pretty recent. Do you try to create a loose atmosphere and say, “OK, guys, it’s going to come, just be patient”? How do you go about it? There’s got to be kind of a mix in there. We have a tremendous coaching staff. I think if you ask anybody in here, they would say the same thing. What they expect from us is to play as hard as we can, to prepare ourselves to play. And if we do that, they’re satisfied. And if we do that and play the way we’re capable of playing, the results will take care of themselves. There’s no tempered expectations. There’s no feel-good, “We almost won, but didn’t win.” We’re going out there to win games. And what about for you personally? You’re at an age where many players come into their prime. You’re coming off an off-year, you’re healthy now. Do you expect to have a big year? I think personally I’ve made improvements steadily throughout my career and I’ve learned a lot from the experiences that I’ve had. The expectations for me are to keep getting better. And I know I haven’t scratched the surface on some things I think I can do, that I know I want to do. I won’t be satisfied until I get there.